It's finally warming up around here, so we don't have to bundle up for the ride to work. Don't get me wrong, the morning ride in the chill air hasn't been so bad. But glorious days like today... the daily commute becomes it's own pleasure. 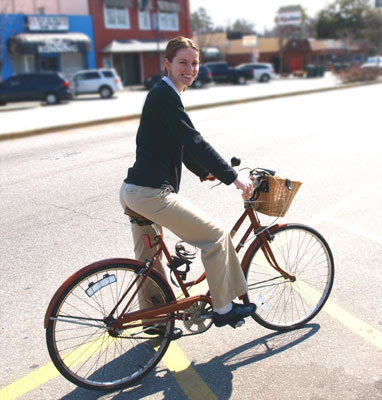 Here's Kelsey riding her bike to work in the sunshine. Nice Bike. Comfortable, upright position. A basket for her things. Fenders and chain-guard to keep road stuff and bike stuff where it belongs. ...even Mondays can be beautiful.